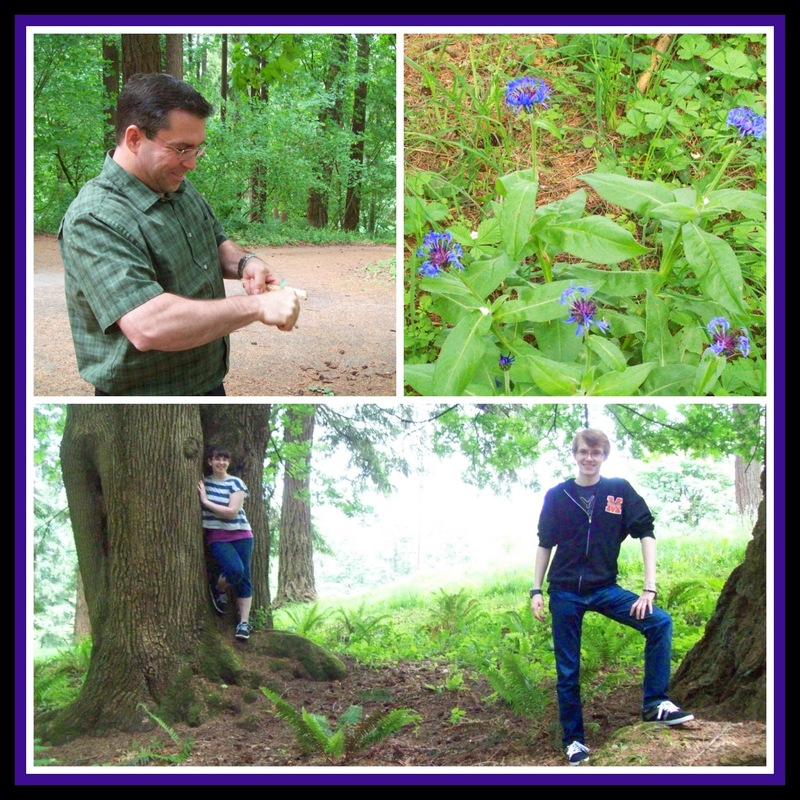 We love to go on fun family outings, our most recent activity was a visit to one of our favorite places to go on an easy hike and explore the outdoors, Mt. Tabor park in Portland, Oregon. We live about an hour outside of Portland, but the first home we had when the kids were babies was just a few minutes away from this park. Mt. Tabor is an extinct volcano, so in addition to lots of beautiful trees, and great views of the city, you can check out the cinder cone of the old volcano. We went on a much longer hike on Mt. Tabor a couple of years back, you can read my previous post, Volcano in the City - Our Mt. Tabor Hike for more pictures. 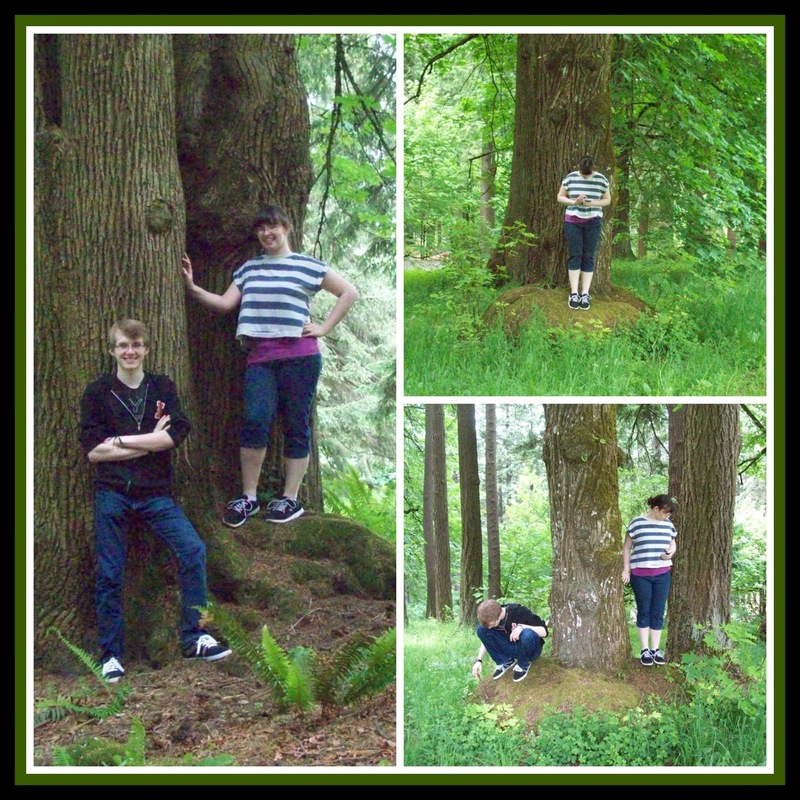 When we got to the park we explored the cinder cone area a bit, and Sarah and Joe had fun taking their own pictures. Sarah loves trees, she is always very happy when she is out in nature surrounded by trees. The bark on this tree was really interesting. 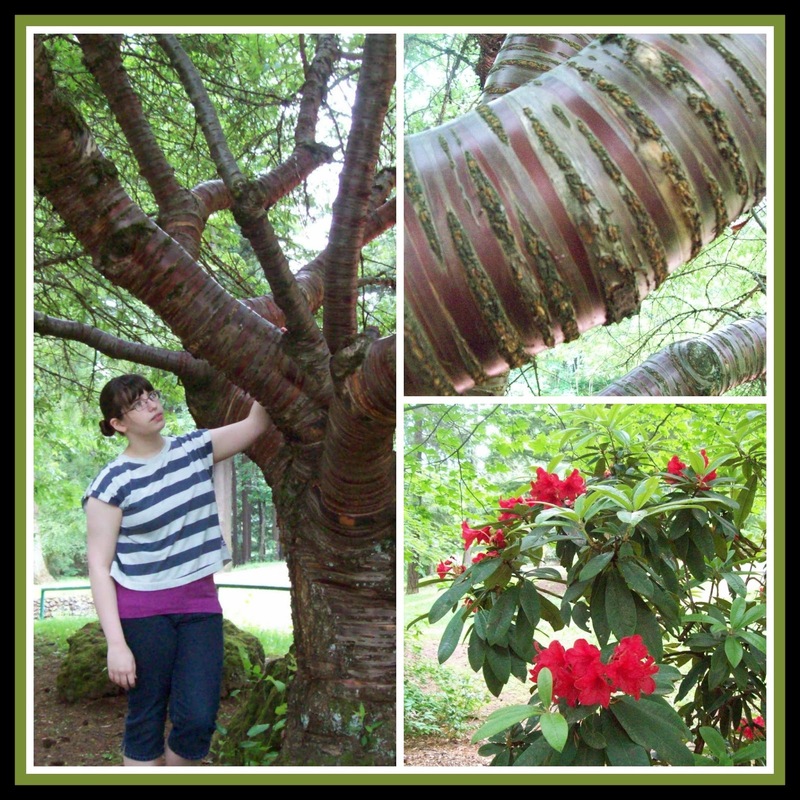 In addition to the stunning trees throughout the park, the rhododendrons were in bloom which was a nice treat. 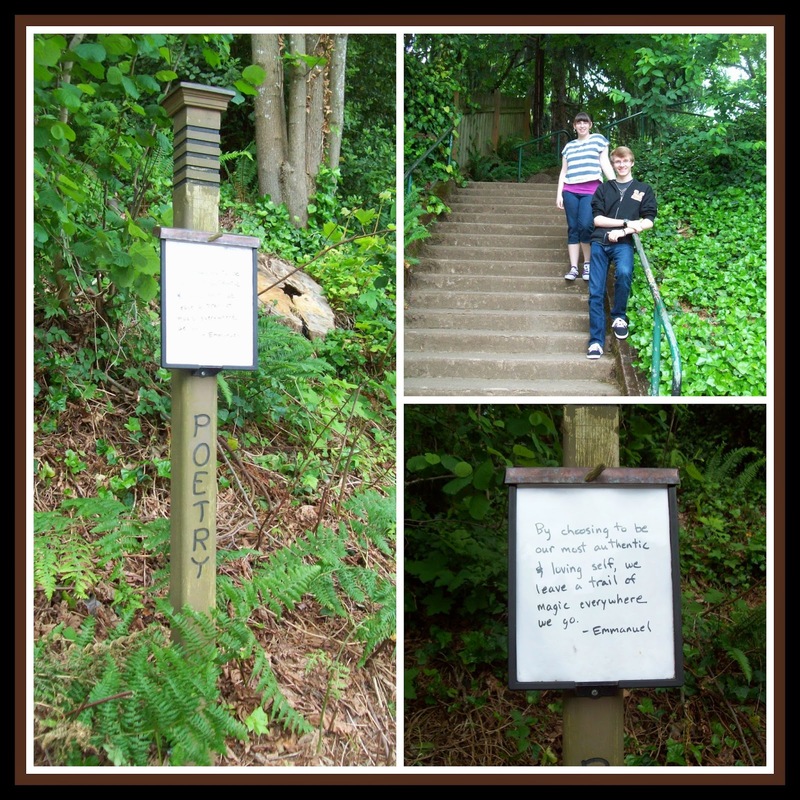 Then we made our way to the very long set of stairs that brings you to the top of Mt. 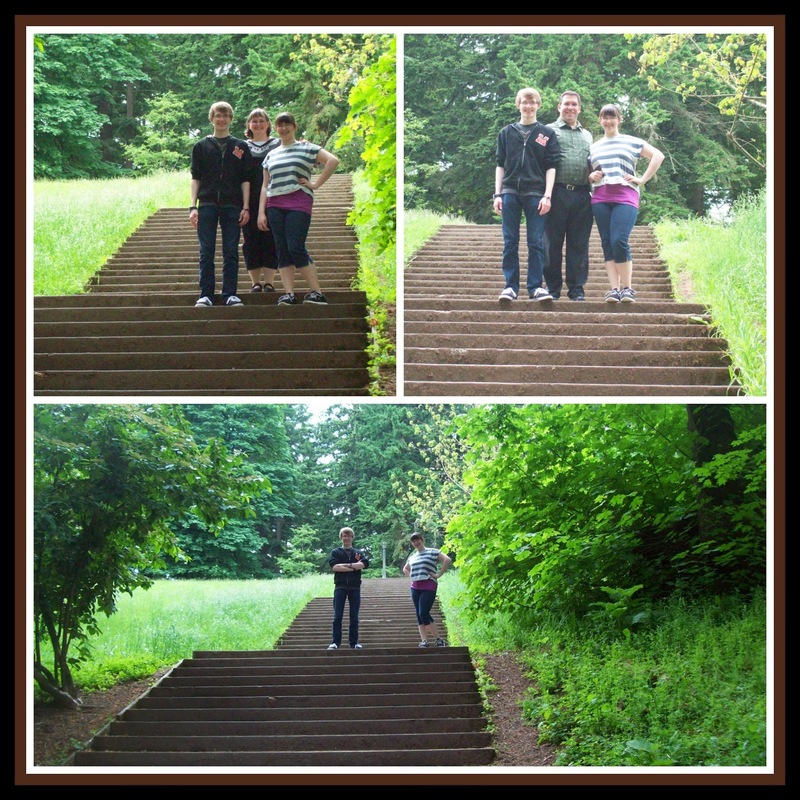 Tabor, we had fun taking new pictures on the stairs so we could compare them to pictures from our last time at the park. 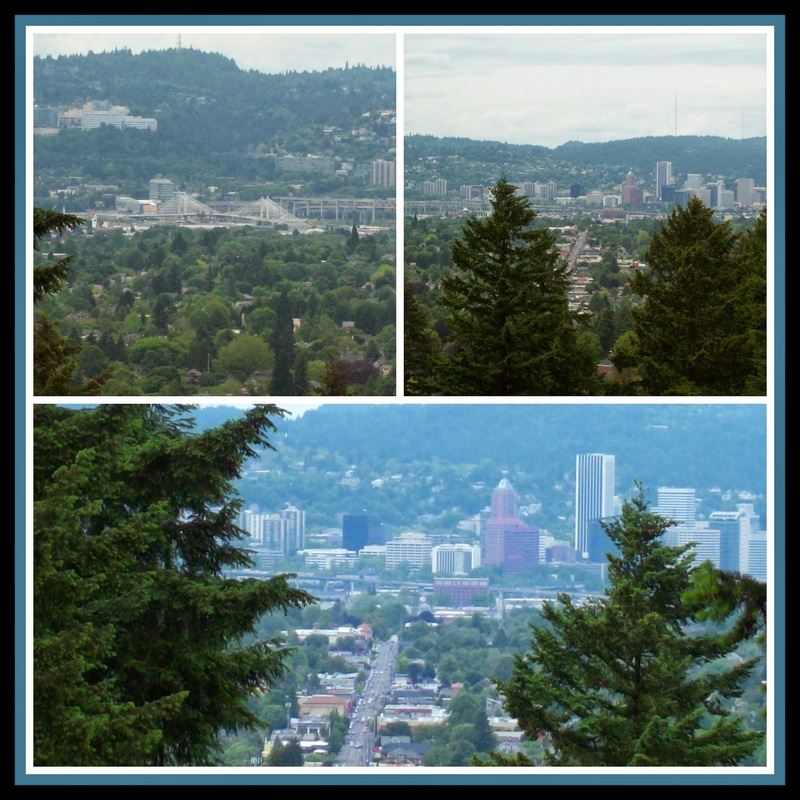 When we got to the top the views were amazing, you could see downtown Portland, and all of its interesting buildings and streets, as well as the bridges (including the new one being built which we look forward to driving over when it is finished). We found a nice area to sit and eat lunch, there were lots of people enjoying the nice weather, and lots of very cute dogs enjoying their walks, we love dogs, so it was fun to see all the different dogs walking by. After lunch we explored a bit more, there were lots of interesting knobby trees. 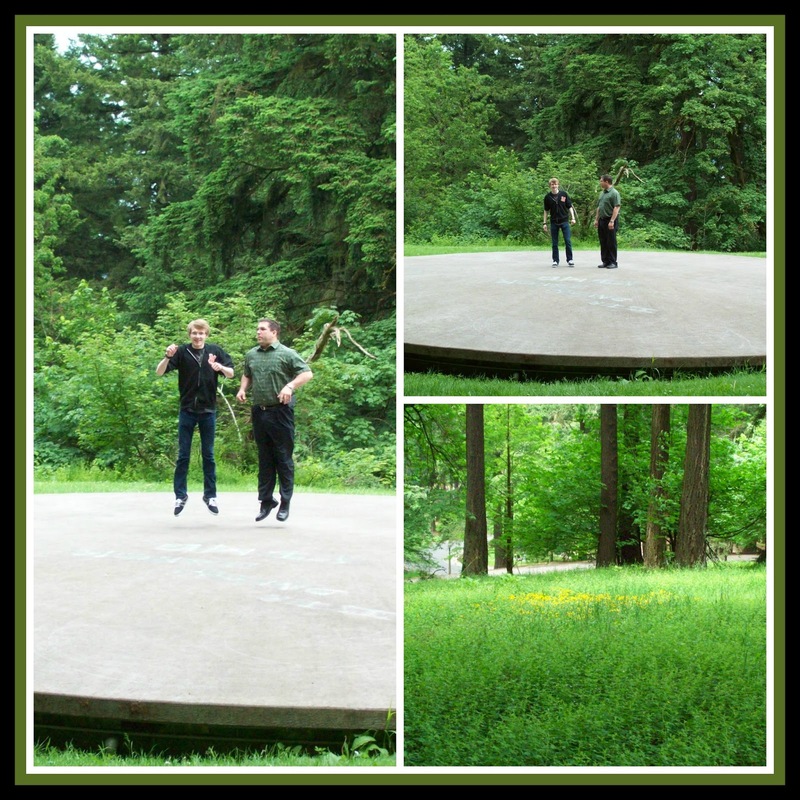 Gary and Joe decided to check out a large cement cap, I got a fun picture of them mid jump! 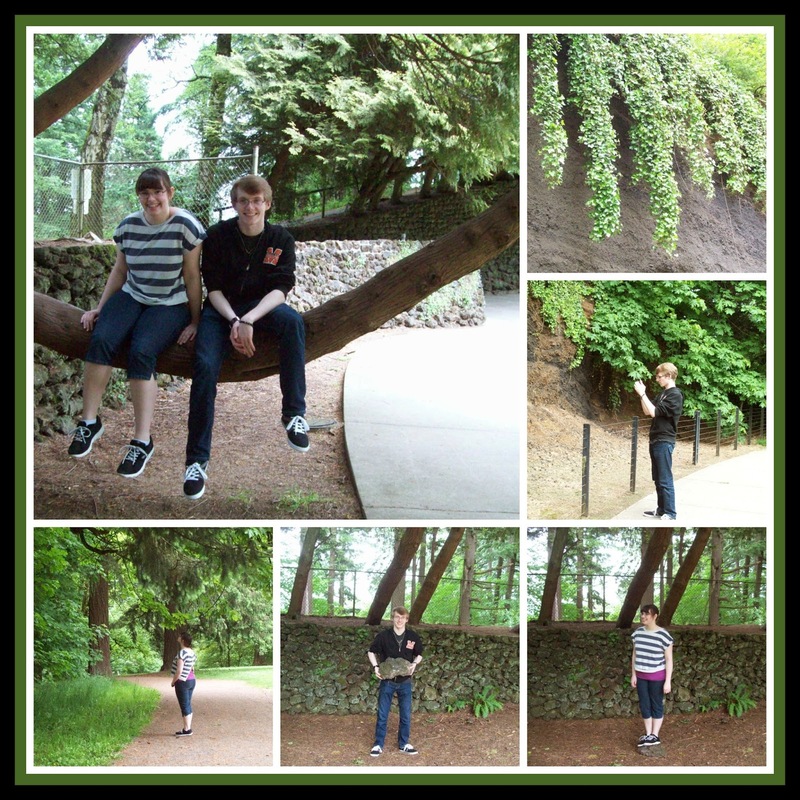 We spent a lot of time exploring the trees and taking pictures. Gary had fun whittling along the way. 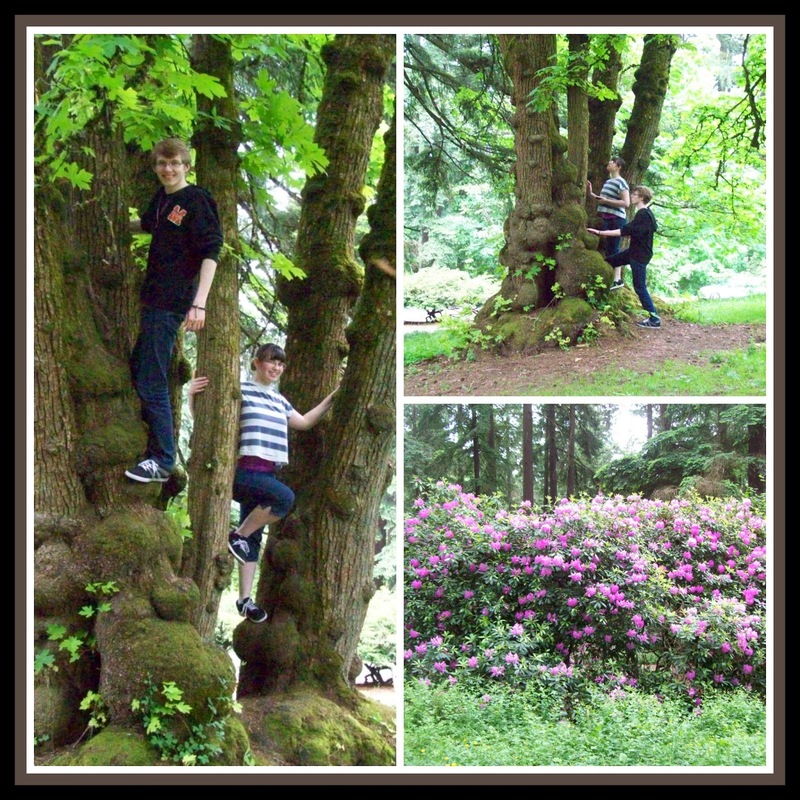 :) We found some pretty flowers hear and there, and really enjoyed a nice little day hike. After we were done at the park we drove around some of the interesting neighborhoods in Portland, it is interesting to see all of the different older homes and gardens, we also saw a lot of different restaurants and food trucks that we hope to come back and check out this summer. One thing I spotted was really neat, and something I have been wanting to do for awhile now, A Little Free Library! We ended up spotting another one a few blocks over as well but couldn't stop for a picture. 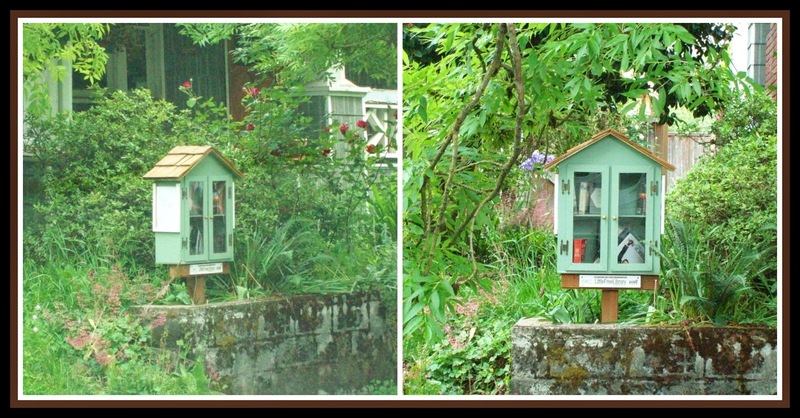 I think the idea of a a little library in my front yard is wonderful! Gary and I hope to sketch out some plans and get one built this summer! :) You can read about it at littlefreelibrary.org. So that was our fun day at Mt. 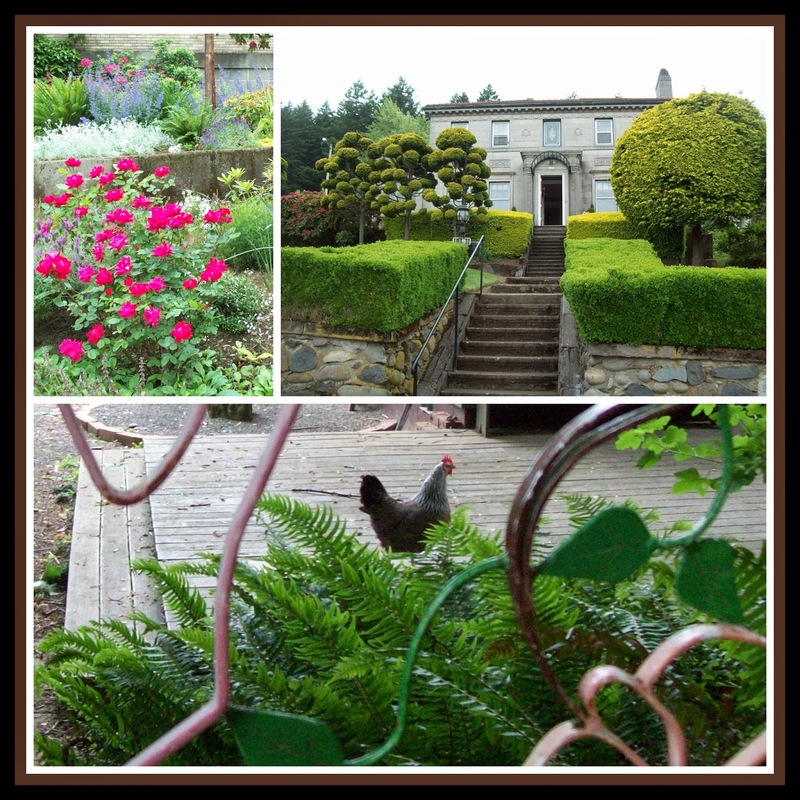 Tabor park, we are looking forward to a summer of fun day trips. What a nice day you had. My hubby grew up in Portland and I wish we lived nearer to it. I'd love to see all those roses.